You may think you know that the telephone was invented by Alexander Graham Bell, and when it happened, but there are people out there who think differently. I didn't write this one. The article (by "A.C.T.") appeared in the Post Office Electrical Engineer's Journal of 1932. In the Science Museum at South Kensington is a pair of instruments, made in 1860 by Philipp Reis, and described as the original telephone. 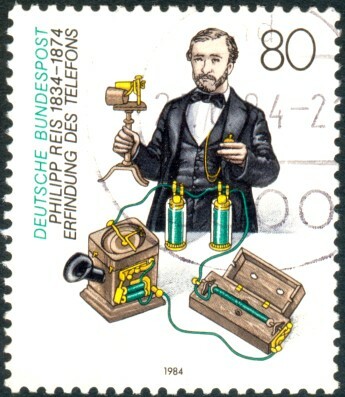 The question of whether these instruments ever really transmitted speech was the subject of fierce controversy in the (eighteen-)eighties, when Graham Bell's telephone was being developed commercially; and Prof. Silvanus P. Thompson wrote a book in 1883 advocating the claim of Philipp Reis to the honour of being the inventor of the telephone. Recently it was suggested that the description of Reis's instruments in the Science Museum was hardly fair to Graham Bell, and the question was discussed by the Council of the Institution of Electrical Engineers. which is reproduced from Prof. S. P. Thompson's book (Philipp Reis : Inventor of the Telephone). The contact was simply joined in series with a battery of 2 or 3 cells (at B) and the receiver, seen on the right of the figure. The electromagnet and key on the side of the box were also joined in series with the other apparatus and used for signalling. In Fig. 2 is shown an earlier form of transmitter. The conical hole (a) in a block of wood served as mouthpiece. At (b) was a thin stretched membrane on which rested (or was cemented) a platinum button. The platinum contact (d) was adjusted by the screw (h). A transmitter of this type was recently tried, at the same time as the original Reis transmitter according to Fig. 1, and could be made to transmit speech for a few moments by careful adjustment of the contacts. When the platinum contacts were so adjusted as to be microphonic (that is, the contact resistance varying more or less in proportion to the pressure) they would act as a fairly satisfactory microphone provided that the motion of the diaphragm was not great enough to cause actual separation and sparking. This was verified by the P.O. Research Section, using a modern receiver and a step-up transformer. When the adjustment was exactly right, speech was transmitted reasonably well, the volume being 20 db or so below that of a carbon transmitter, but it was impossible to keep the adjustment right for long. Loud speech caused the contacts to separate and scratching noises were heard in the receiver, but quiet speech was transmitted with good quality. The Reis knitting needle receiver was not nearly so efficient, however. The model in the Science Museum showed signs of having carried an excessive current, the cotton insulation being charred in places, and the iron core seemed to lack the right magnetic properties. At any rate, it could only be made to produce audible speech by the use of an amplifier having a gain of about 30 dbs, but the quality of the speech was very good. The phenomenon of talking relay cores is not very uncommon in exchanges, and at Marlborough Repeater Station many of the input transformers emitted speech in sufficient volume to perturb the man on night duty. If the state of the core material happens to be favourable for this phenomenon - now known as "magnetostriction" - the volume of sound can appear surprisingly great in a perfectly quiet room. Thus it is fair to assume that some of Reis's knitting needle receivers may have been far more efficient than the specimen tested and capable of translating into audible speech the currents produced by one of his transmitters when this instrument was working under exactly the right conditions. In Prof. Thompson's book there is evidence from various contemporaries of Reis that speech was transmitted by his telephone, though very unreliably. It would seem that the conditions were not clearly understood, for singing was mere frequently transmitted and the right adjustments for speech were obtained rather by accident than design. There is one record of a statement by Reis, however, which shows that he had at least some inkling of the nature of a microphonic contact. He is reported to have said frequently "You understand it is a molecular action" (molekular bewengung). There is no mention of the use of carbon for the contacts. Various metals were tried and platinum was no doubt finally selected because it would stand up to the sparking which must have occurred in such a low resistance circuit. In weighing the evidence, it must be remembered that the marvellous adaptability of the human ear enables telephone speech to be tolerably well understood even when it is so distorted and weak as to be scarcely detectable by any other means. If we assume the tension of the diaphragm and the condition of the contact to be just right, and the listener to be in a perfectly quiet room and not too critical - then speech could certainly have been transmitted, though at a level of volume and intelligibility far below what is now rather vaguely known as the "commercial limit." It was probably in such exceptionally favourable conditions that Reis's telephone "talked" and the small amount of contemporary interest which the invention seems to have aroused was no doubt due to the extreme weakness and unreliability of the transmission. To sum up : Philipp Reis is certainly entitled to the honour of making the first telephone, though credit for the invention of the telephone as we now know it must be shared between Graham Bell and Hughes.